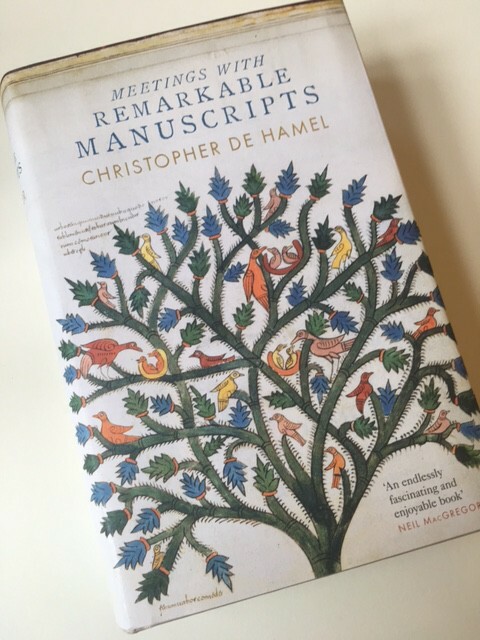 Any book written by Christopher de Hamel is always worth a second glance, but this new book – Meetings with Remarkable Manuscripts – is one you will find hard to put down again! Christopher has such an easy writing style which, in this book, seems almost as if he is sitting by you as you turn the pages in each of twelve featured major manuscripts, explaining what is on the page, and adding nuggets of information, popping up like jewels of wisdom to make each one even more real. As he explains, manuscripts are a direct link with people in the past – the book is something that they held, owned and looked at. They pose many interesting questions, and Christopher answers a number of them. 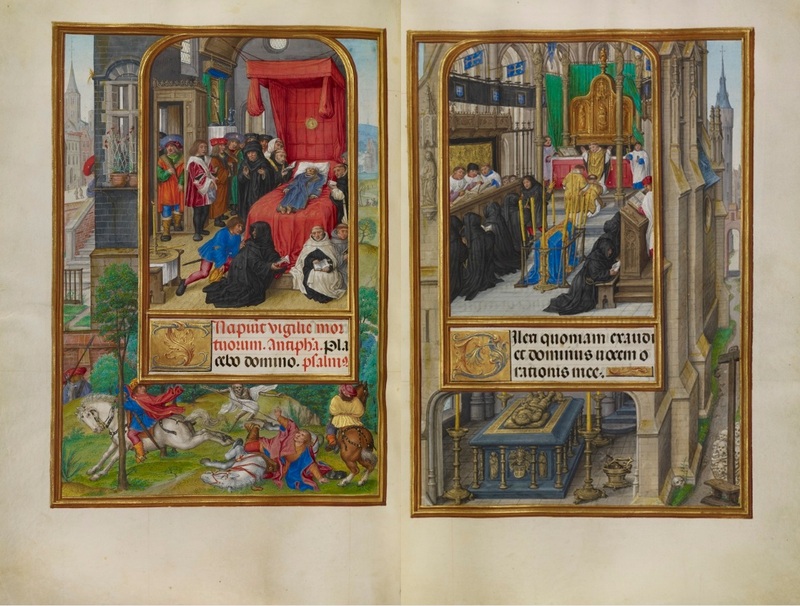 Each of the twelve manuscripts has its own chapter, and the books range from the sixth-century St Augustine’s Gospel to the sixteenth-century Spinola Hours. 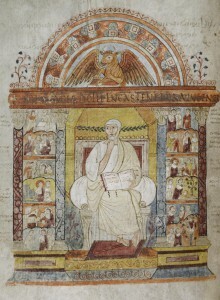 A unique feature is a photograph of the book itself, showing the front cover, and scaled to the Codex Amiatinus, the largest codex in the book, and shown as large as Christopher’s book will allow; this allows us to see the relative size of each manuscript. 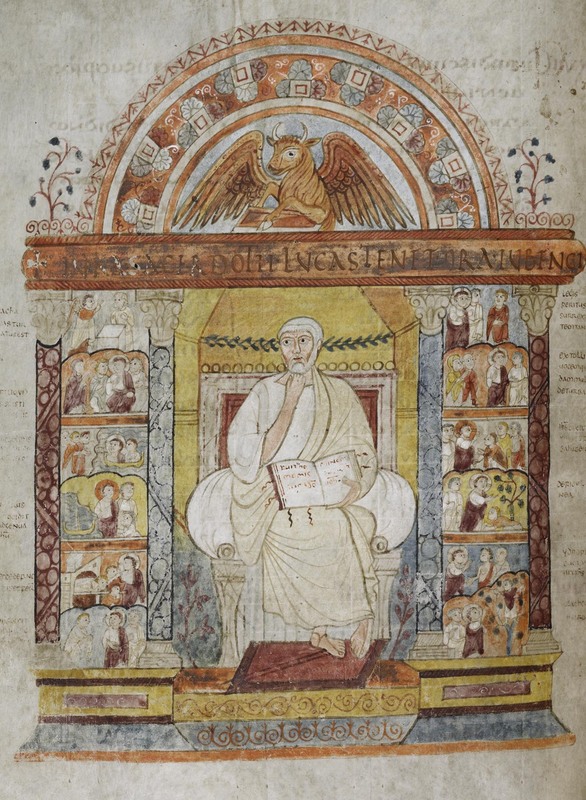 The St Augustine’s Gospel is, of course, well known to the book’s author, as this is a manuscript in the Parker Library at Corpus Christi College in Cambridge, of which Christopher is currently the librarian, although he is due to retire at the end of 2016. The Gospels just c o u l d have been a book brought over by St Augustine himself in 597 or sent by Pope Gregory the Great to help the saint in his mission soon after. You will have to read the book to see whether it was, but also to find out at first hand what it is like to be the person with the responsibility of not only transporting the Gospels when each new Archbishop is enthroned, but being the person carrying the book in the procession. 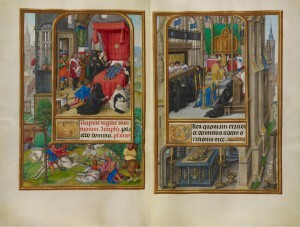 The Leiden Aratea, can be viewed digitally here, but there is nothing like seeing a manuscript up close and personal. This is what Christopher has done with all twelve manuscripts. 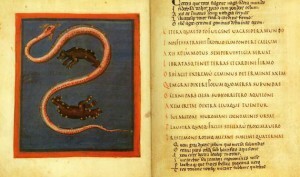 The Aratea comes from the name of the astronomer Aratus of Soli, and the book contains thirty-nine full-page illustrations of the constellations. 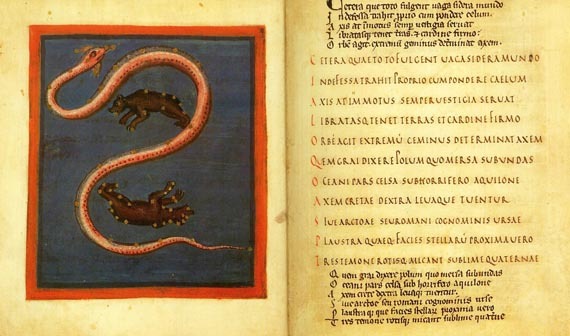 The lettering is in fine Rustics, and the image on the right shows Arcturus major and Arcturus Minor, the bears between a coiling snake, which mark the north pole, and the stars of the constellation are indicated by gold squares. Perhaps we know the constellations better as Ursa Major and Ursa Minor with the north star. The book’s links with its Roman ancestry are pointed out by Christopher and then he explains why it is definitely a Caroline manuscript. All aspects of each book are considered, including the known history of the manuscript, how it came to be where it is now, and also the making of facsimiles. 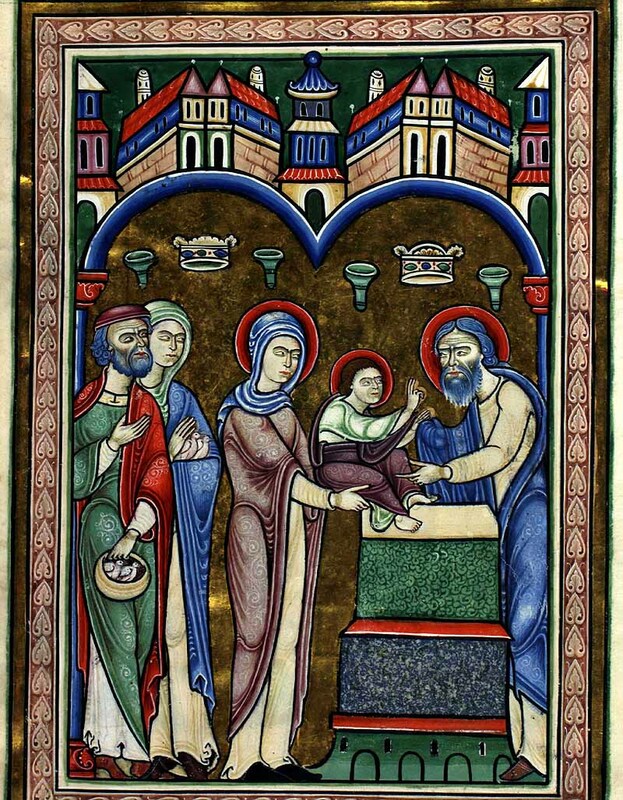 The Copenhagen Psalter (book of Psalms) is the sort of illuminated manuscript that anyone who thinks of the same would have in their mind’s eye. 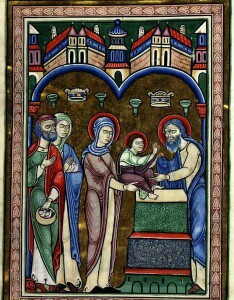 It is littered with richly illuminated pictures which tend to have rather bad-tempered figures, as on the right – the Presentation in the Temple (note the two little birds being carried in a basket, and two others being held). The ‘single’ eyebrow, with a slight dip over the nose, is usually the reason for the appearance of crossness. Mary, here, doesn’t look at all happy at what is about to happen. Where the book was written, where it was illustrated, and the fact that it’s not complete, are all included in this chapter. However, these are only mere flavours of what this book offers the reader. Each chapter describes the library or museum in which the manuscript is currently held, how it got there as well as the book itself. It is eminently readable and is most highly recommended for both those with an interest in manuscripts as well as those without. This book will change the view of the latter in that there is a great deal to be learned and appreciated from these wonderful relics of times past. Put this book on your Christmas or birthday list and hope that someone reads your list; you won’t regret it! This entry was posted in Blog, Calligraphy and lettering and tagged Book of Kells, Carmina Burana, Christopher de Hamel, Codex Amiatinus, Copenhagen Psalter, Hengwrt Chaucer, Hours of Jeanne de Navarre, Hugo Pictor, Leiden Aeatea, Meetings with Remarkable Manuscripts, Morgan Beatus, Penguin Random House, Spinola Hours, St Augustine's Gospels, Visconti Semideus on 16 October 2016 by Patricia.